Man Proposes to Girlfriend Using 25 iPhone Xs | OhGizmo! You know what they say, the fastest way to a girl’s heart is through 25 iPhone Xs. At least that’s what Chen Ming must’ve heard as the video game developer based in China used 25 of Apple’s latest iPhone to propose to his girlfriend by arranging them into the shape of a heart. 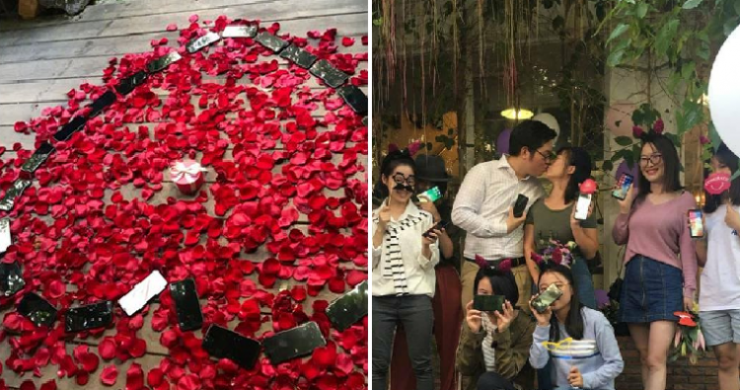 To help with the proposal, Ming had several of his girlfriend’s friends bring her down unknowingly to the spot where he arranged the phones into a heart surrounded by rose petals, before getting down on one knee and popping the question, which she said yes. Don’t get me wrong, it’s a cute story and all, but personally I think he’s crazy for wasting so much money for an outlandish display of love… I mean, clearly he should’ve used no more than 20 iPhone Xs.